This learning section provides a comprehensive overview of counterpulsation therapy and related equipment for clinicians who are new to Intra-aortic balloon pumping or those who desire a detailed overview. This track includes sections on indications for use, contraindications and complications associated with IABP therapy. 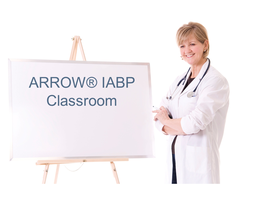 The Care of the IAB Patient module includes sections on nursing care, as well as timing and assessing timing of the IABP console. This module reviews the physiology and function of the left ventricle (LV) with specific emphasis on hemodynamics, including the concepts of preload, afterload and cardiac output. Focus is placed on LV functions that will be affected by IABP counterpulsation. The principles of counterpulsation are reviewed with emphasis on the specific effects that inflation and deflation impose on LV function with the resulting change in the patient’s hemodynamics. This module review the normal balloon pressure waveform, how the waveform is created along with the normal and abnormal condition that can occur during therapy. The relationship of the BPW and IAB sizing assessment as they relate to gas alarms is discussed. Further review of the IABP alarm system, patient condition assessment and the basic troubleshooting of common alarm conditions is discussed. This module reviews the criteria for selecting the appropriate IAB size, preparation of the catheter for insertion and the insertion procedure. A recommended nursing care plan for providing care to IABP patients is reviewed, including an overview on transport considerations, weaning IABP support and IAB removal with emphasis on nursing assessment during and post-therapy. This module provides an overview of the purpose and importance of proper IABP timing. The physiologic effects of IABP therapy are reviewed as related to correct and incorrect timing states. The three basic rules of correct timing are discussed based on the desired hemodynamic effects and the relationship with regular and irregular heart rhythms. Exercises are provided to practice timing assessment. This section presents application of the timing rules with different ways of determining the Arterial Pressure landmarks on the Assisted Waveform. This module reviews the purpose of triggering along with the trigger modes available on the IABP console. Clinical situations are discussed as they relate to proper trigger mode selection.